Last week, I attempted my veil that I ordered from Veils and Mantillas. They have an Amazon and an EBay store as well as a Facebook page. I keep a mini side part most days and I did last Sunday. Well, the comb I sewed in kept sliding down my part to the right side of my head. Little Miss kept tugging on it from under my arm while she nursed and Middle Kid just thought it was fantastic for ducking under when we had to stand (he’d stand on the pew and hide under the veil). So, I will tuck it away until the kids are older. Meanwhile, I shall utilize the many Pashminas GamerDad purchased while in Afghanistan. I will also note that while at our out of town parish last week, I spotted one other veiler. 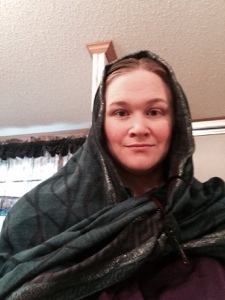 My FIL inquired at Nana’s why I chose to veil. I went on a long spiel and got, “ok…” as a response. I was hoping for something more for a response, but at least the family now knows why I have opted to get into this. Yep, I am a huge fan of turquoise too. It fits for this week since we are getting back into Ordinary Time and it pairs nicely with my eggplant colored top. You cannot see it, but I am wearing black slacks. We’ve been blessed with 70’s this weekend. No doubt, our parish will still have the heat on and my outfit will help keep me cooler. 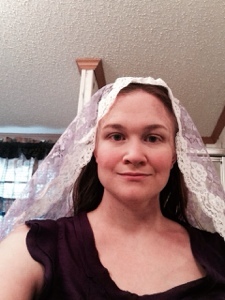 What veil/mantilla/shawl/head covering are you wearing this week? Please post and link back here to get this linkup started! 🙂 Forgive me for forgetting who suggested I do this, but thank you! !